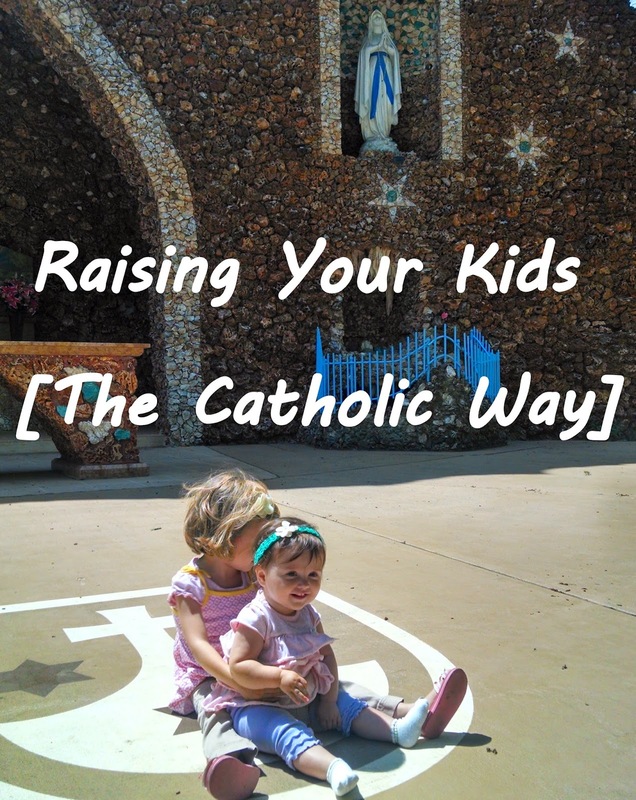 So, this is the first installment in a new series, "Raising Your Kids [the Catholic Way]." For more great tips on raising your kids (especially your littlest ones!) Catholic, be sure to check out the book! So, I've shared before that Andrew and I both grew up in Catholic homes, and I think that was one of the greatest gifts our parents could have given us. 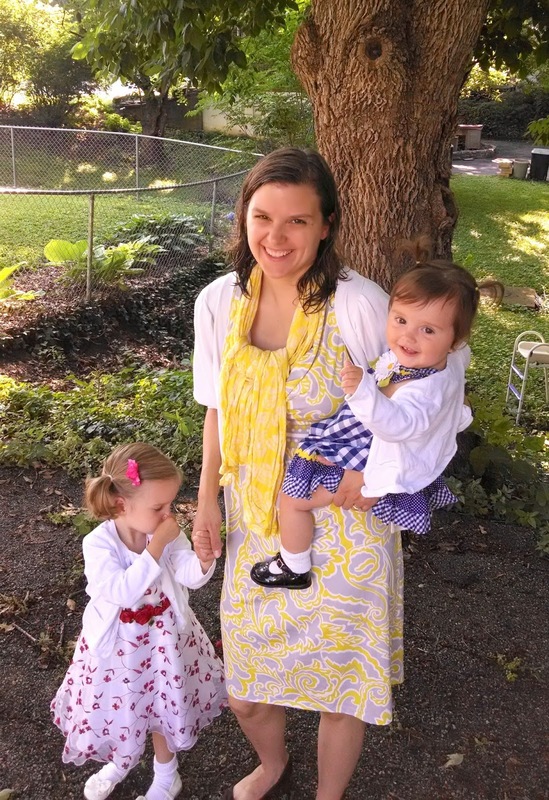 The Catholic culture that got passed on to us is making it easier to form our own domestic church. One of the traditions passed on to me by my parents is to visit cemeteries and pray for the dead (especially loved ones that have died). I very distinctly remember the moment that I first learned how to pray for the dead. 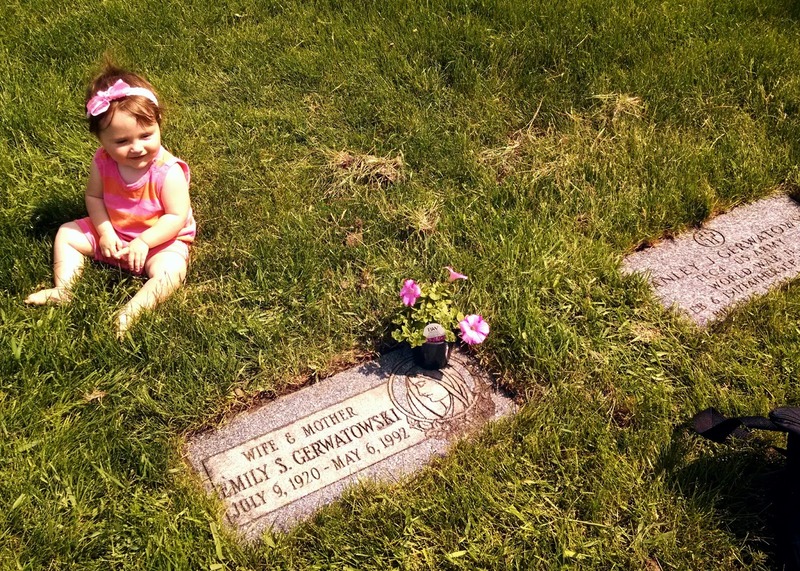 I was just under two months shy of my sixth birthday when my Grandma Emily died of breast cancer. My mom got the phone call in the late afternoon, before my dad got home from work. We were in the kitchen (remember the days when there was only one phone in the house, and that phone had a cord, so you had to answer the phone and talk in one room?) hovering around my mom, when she got the call. She gave us the news and I said, "Let's pray for her! 'Bless us, O Lord, and these thy gifts..." But then my mom gently explained to me that there was another prayer we could say for my Grandma Emily. She taught me to pray, "Eternal rest grant unto her, O Lord..."
The experience of losing my grandma (my mom's dad had passed away before we were born) stayed with me, as did the experience of later losing my other grandparents, and finally the sweetest grandmother-in-law in the whole world. There were other people who I knew who passed away, too - family friends, extended family members, schoolmates. And each time, it was an opportunity to be reminded that this big crazy church of ours extends beyond the bounds of this world. What does it mean to be "militant"? It means that now is our time to love as much as we can, and to give God all we can to help to fight the battle against evil in the world. Now is the time to do all we can, by the grace of God, to bring God's love to a fallen world. And one of the most powerful ways to do that is to pray for the dead. Those who have died and go to purgatory are definitely going to be in heaven. Purgatory is not hell. Those in purgatory have chosen God - but they have not yet chosen God completely. Purgatory is a time to do away with all of your selfishness, all of your anger, all of your hatred, all of your jealousy, all of your impatience, all of your materialism...anything that keeps you from being free to love God and others. I often tell Andrew, "Man, I know what my purgatory is going to consist of..." because I know what sins I struggle with over and over again, and I doubt that I'll have broken free of them completely by the time I die. Purgatory is a beautiful teaching because it's God's merciful way of helping us to be totally ready to meet Him. But man, the suffering of knowing that you're going to be with God, and finally realizing how good God is, but then having to look all of your sinful attachments in the face? That must be a doozy. I'd imagine that it's like when you realize in this lifetime that you're wrong about something...magnified by 1000. No one likes the shame that comes with being wrong. And no one wants to admit that they've been wrong. It's a hard process. But...the soul in purgatory knows one thing. She knows that God wants her and that she wants God. But... the soul in purgatory can do nothing about it. He cannot pray for himself, and so he must rely on the grace of God and the prayers of others. We are connected, all of us. We are connected to the saints. We are connected to those in the Church on Earth. We are connected to those trying to be cleansed and healed in purgatory. We are united in the Eucharist, as one body of Christ - one Church. And we all desperately need each other. Because deep, deep down...we all want to be one! And so, as an act of love, we pray for the dead. We pray for them because we still love them, and we still want the absolute best for them. We pray for them because it is all we can do for them anymore. The only way left to care for them is to pray for them, and to pray that they will be ready to meet God quickly. But what if they are already in heaven? Why keep praying for them? Other than in the case of canonized saints, we don't know for sure that they are in heaven. So, we pray for them. But, if they are already in heaven...then they begin praying for us. So, it's a win-win. Why do we visit cemeteries, then? Because we believe in the resurrection of the body! 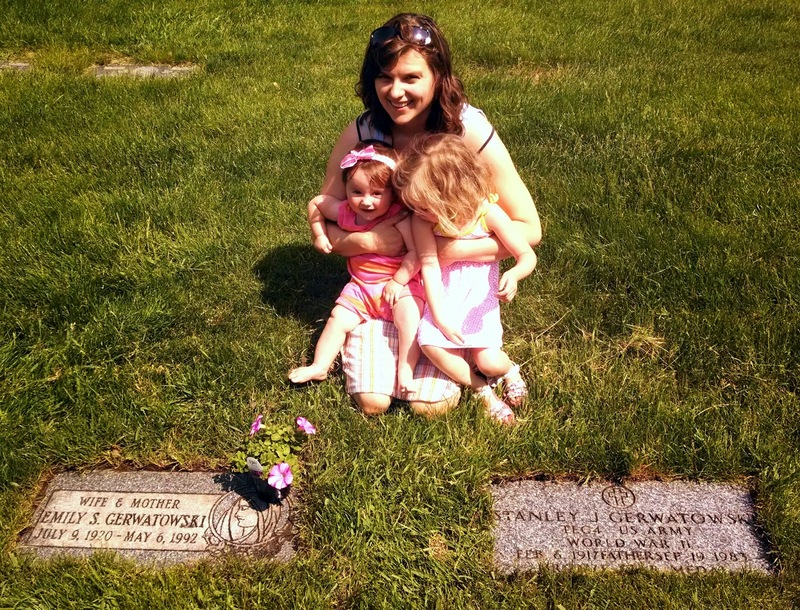 Visiting cemeteries, and tending to the graves of loved ones is our way of affirming the goodness of the body, and our belief that the body will one day be glorified. Plus, it's a comfort to us. It gives us a concrete way to remember that we are still connected to the whole Church, even those no longer in this world. This post is such a great reminder to start young with our kiddos. We just moved back to my childhood home, and I've been meaning to go to visit my family's cemetery for the past few months and just haven't yet. But this post has definitely motivated me, so thanks! My children were just commenting about when we went to the cemetery to walk and pray for All Souls Day. We had intended to do it each month, but winter got hard and it slipped off our radar. I think we need to start praying for our dead loved ones more. Thanks for the inspiration.